Before we get into the history of this site and it’s logo, grab a snack, sit back and relax because.. It has long since been my dream to work from home doing stuff that I love to do. I’ve been an artist ever since I can remember, and it’s been a part of my life from a child growing up. Back in the day, I would visit my Grandma and Grandpa in Smithtown, Long Island. My Mom, Dad, and I would take the 10 hour drive up I-95 North from Raleigh, North Carolina. These were some of the best times I had growing up, and I will always think fondly on road trips during the summer and winter months. We would visit at least twice a year, for Christmas/Thanksgiving, and also other various events like Family Reunions in the summer and just to visit in general. 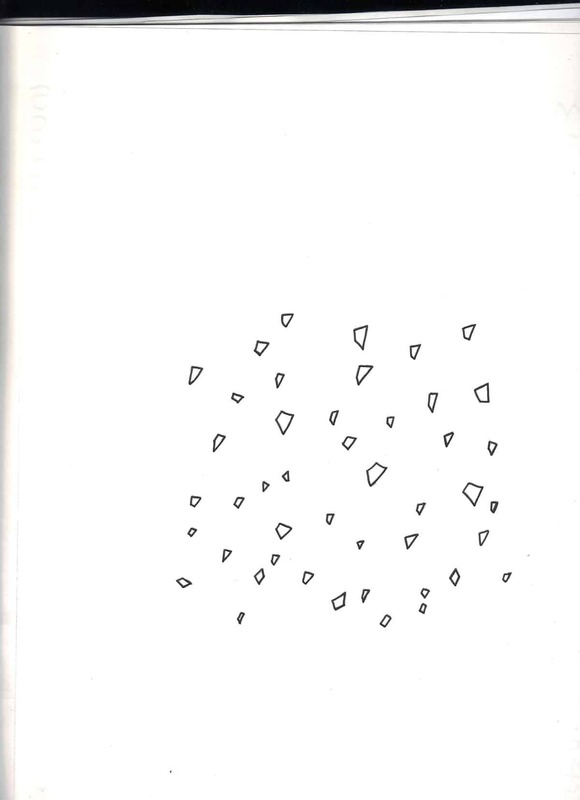 Before we left to go back home, I would always draw a picture of the kind of cereal she had at that particular time. One year it was the Crunch Berries variety, one year it was Froot Loops, one year Rice Krispies, etc. She always loved the pictures, and until the day she passed away she told me I was an artist and had a great gift. “You’re a natural!” she would exclaim. That encouragement from such a young age was much needed in my life, as I often felt like I never fit in with the other kids. 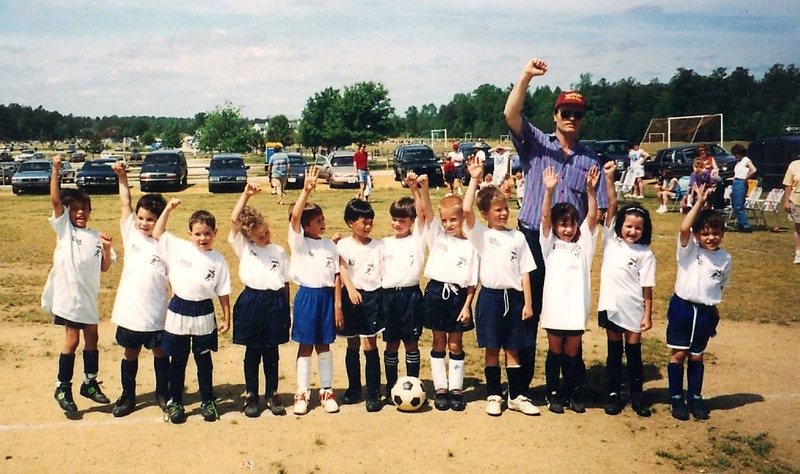 It seems as though I always stood out in some way, even though I would have preferred the opposite! It’s funny how our mindsets change as we grow older. Nowadays I’m grateful that I was always the oddball. Who’s that nerd with the bright blue colored shorts on? Oh that’s me. Lol. As far as art is concerned, I wouldn’t even call it a passion of mine. It’s just hard wired into me and it’s who I am. My name is Stuart after all 😛 I like most forms of art including drawing, painting, graphic design, making beats, playing guitar, making/editing videos, taking/editing photos, sculpture/woodworking, etc. Really anything that can be considered artistic, I’m all about it. I suppose I just look at the world in that kind of way. A right brained person if you will. The funny part about it is that I’m also extremely analytical and methodical in the way I make art (and in general), so in that sense I’m also a bit left brained as well. I think about situations, events, and the world in a very conceptual way, without really trying to. There is meaning behind everything you see, hear and experience, and I like to make art in a way that describes this through anything ranging from a play on words, to simple nostalgia, to irony, and everything in between. You may think some of this is stupid and that’s okay. For me, making art isn’t about being perfect or getting it right all the time. It’s simply about making art and not really giving a crap who likes it or doesn’t like it. Some ideas work, others don’t and that’s okay! Communicating ideas in bizarre, strange, and clever ways is something that I’ve always enjoyed doing. When I was in college, a guy who who was in my Painting II class (around 2012) called me “Banksy with a Canvas” because he liked the way I conveyed my thoughts through the medium, and from a conceptual standpoint, he thought I had a lot of potential. In 2014, my Grandma came to visit in December of that year and I told her I didn’t want to work a 9-5 job anymore and that I was going to do something about it. Her and my mom were skeptical, but I stuck with it and in 2017 I was finally able to leave my job and pursue marketing and graphic design full time, while also launching another website Painterly Stew for the conceptual/art side of things. That site has been on the back burner for some time, but real work will begin on it in the near future. As far as this site? Really I stumbled into marketing completely on accident. I was heavily into making beats at the time, and because I had done it for so long and felt my work was good enough, I began searching for ways to market myself and sell online. In searching, I came across a program called Wealthy Affiliate, which is a marketing platform designed to help bloggers create websites about things they are truly passionate about. 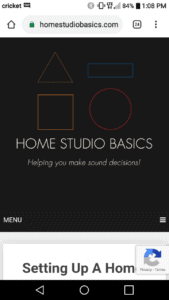 Because I have always loved music, and had a lot of knowledge concerning the small home studio, I began a website teaching people how to start their very own studio at the lowest cost possible. The guide is simple, straightforward, and costs around $1000-$1500 of investment. Check it out here! I do update it from time to time, so please let me know if there’s anything I can do to make it better! After the guide was finished, I began blogging about beats, and my experience over the years with different people in the Hip-Hop scene. The rest is history as they say. About 400-500 posts later, I am still writing articles and making recommendations. Right now it’s mostly in the headphone realm, as I’ve garnered a lot more experience with different types of audiophile grade headphones, amps, DACs, and the like. I also have experience with audio interfaces, studio monitors, turntables, microphones, MIDI, and much more. Check out my review section here!! Once I began work on the site and had a solid backbone to work with, it was time to come up with a good logo. I had found some old thumbnails from around October of 2015, and thought I would share them. 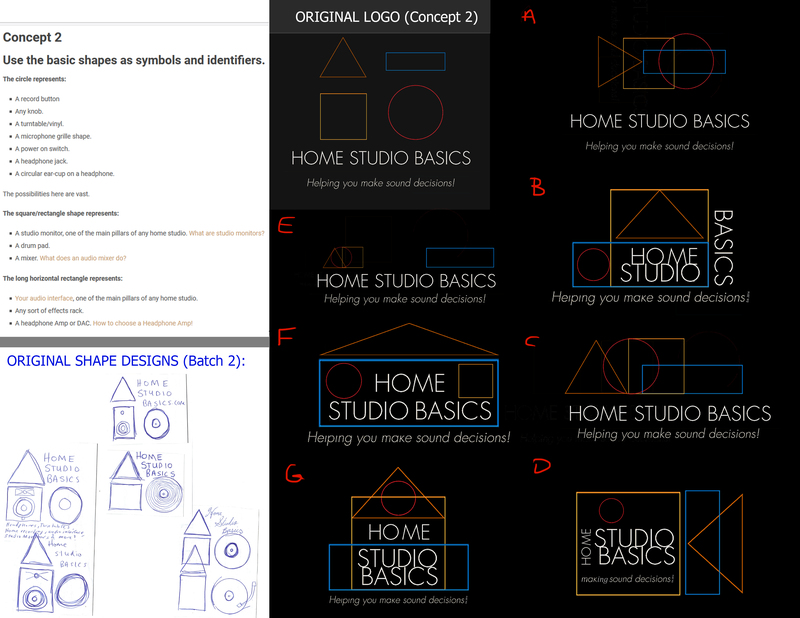 Being that the site is celebrated it’s 3 year anniversary in December of 2017, I wanted to show you my thought process and how the Home Studio Basics logo came into being. Because I have a background in Graphic Design, I like to come up with my own ideas and ways to brand myself. Though my logo for this website is quite simplistic upon first glance, a lot of thought went behind it’s creation. I wanted the logo to be iconic yet simple in nature, but also be clever in some way. 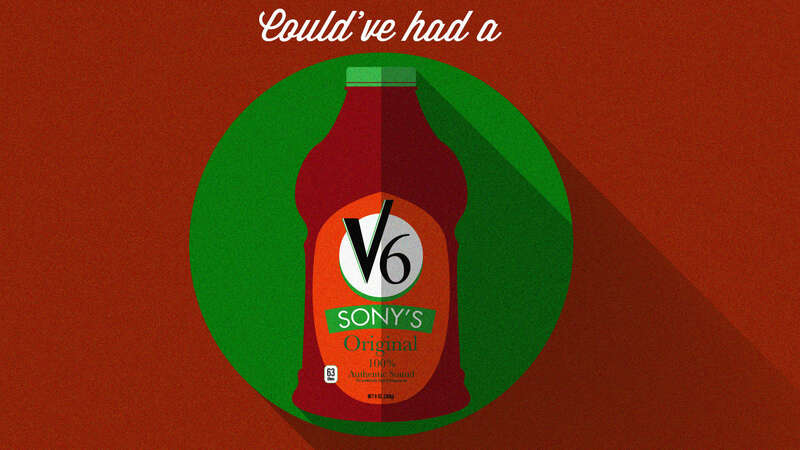 I wanted it to stand the test of time while also being immediately recognizable. When people look at it, they should instantly associate it with me, my brand, and my website. Incorporating meaning into my work has always been a priority, and I strive to tie in some sort of concept to go along with most everything I do. 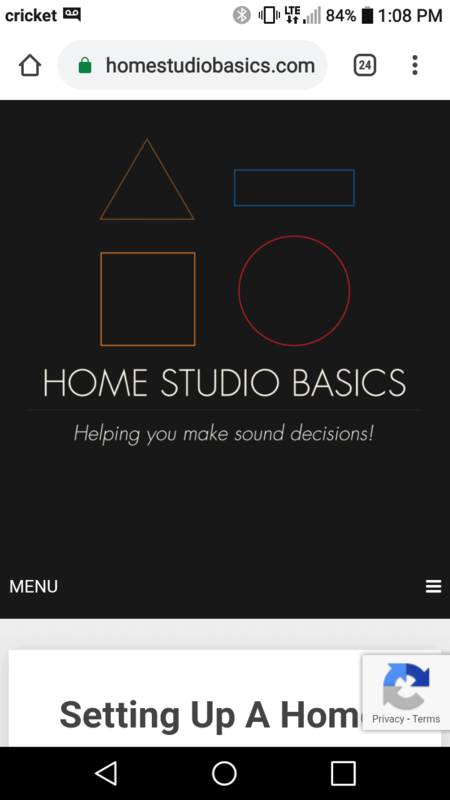 Create a logo that represented the “Basics” in Home Studio Basics. 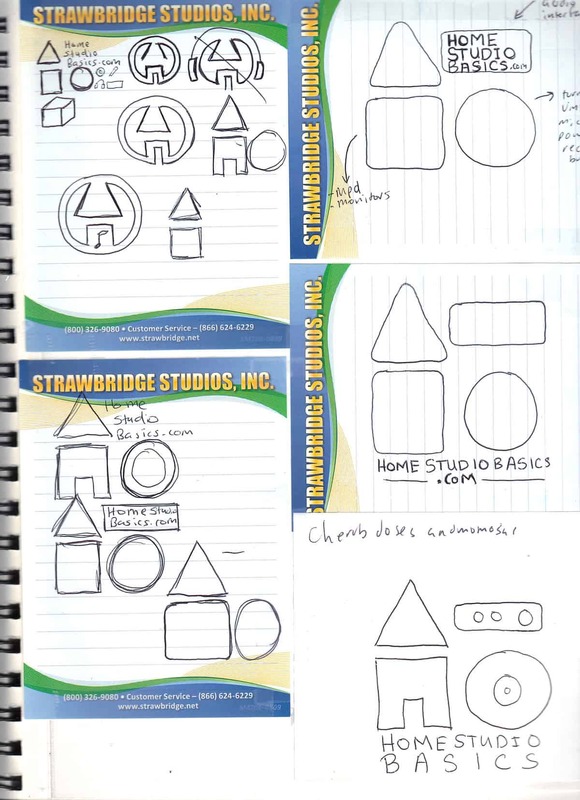 Use shapes as identifiers and symbols. Tie in the “Home” part in a subtle way. So I got to work. Try not to laugh at these thumbnails. Hehe. No one ever said the process was pretty! 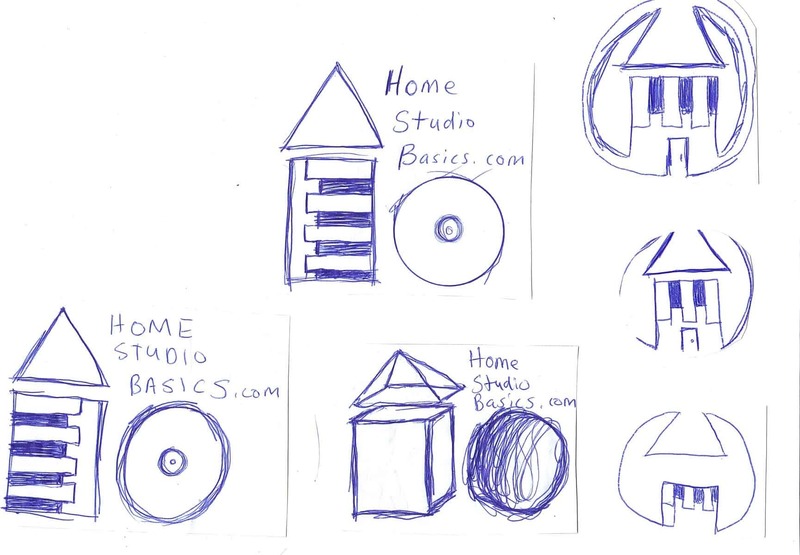 My brainstorming started with trying to come up with an eye catching design. 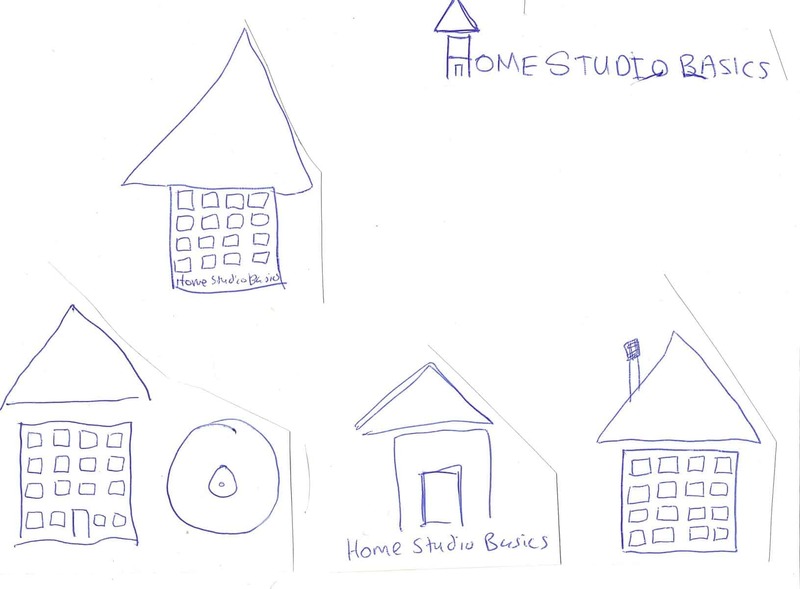 I wanted to use the lines to create an abstract shape that incorporated a roof, and a house with a door. My first thought was seeing if I could make the logo resemble something you would see on the chest of a super hero, or something that you could dip in ink and stamp. 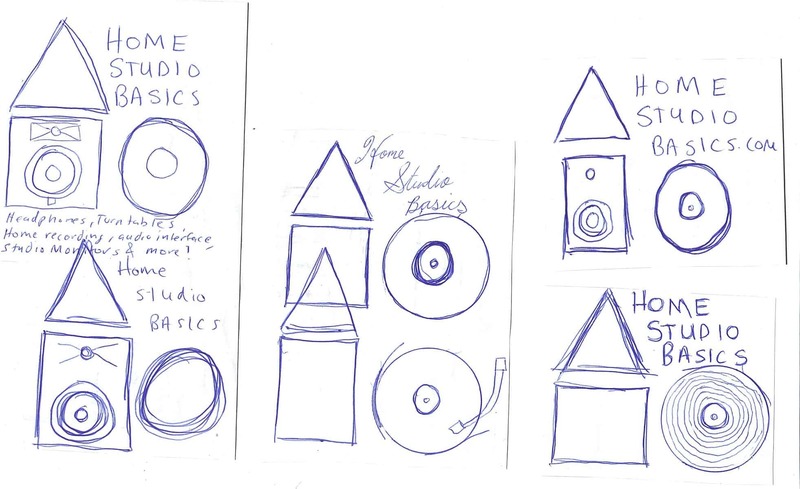 In batch 2, I started experimenting with the basic shapes while also making them into various pieces of equipment. The rectangle being a studio monitor, and the circle being a record player. In Batch 3 you can see me trying to incorporate the keys of a piano somehow into the mix, but I wasn’t feeling it. I tried once more with a drum pad sort of look in batch 4, but it wasn’t coming together. I came to the conclusion that using the shapes in that manner was a little bit too literal for what I was going for. I even thought about a 3-d look, but of course that went against my K.I.S.S. philosophy as well, so I moved on. You can see that it’s starting to come together a little bit, and I’ve really decided on simple shapes with some text. The idea of a circle as a record button is kind of cool, but I didn’t like how it turned out in Illustrator so I scrapped it. This represents just about the final product. Here I start to tighten things up and think about where I want to place the text. The thumbnail on the middle right is what I settled on before I took things to Adobe Illustrator. 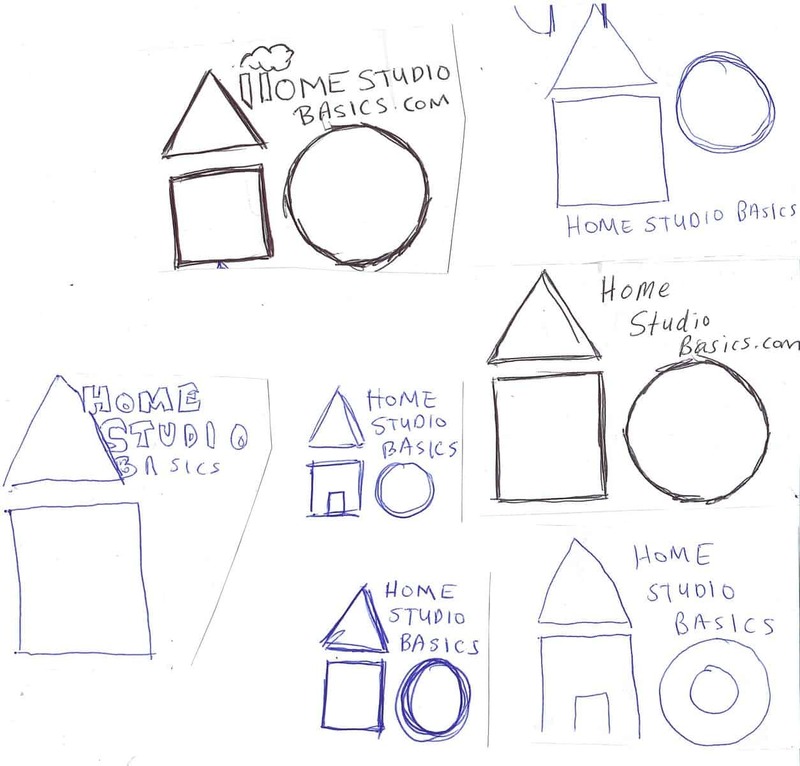 Use basic shapes in reference to “Home Studio Basics.” I chose a rectangle, square, triangle and circle. My philosophy here has always aimed to explain things in a way that’s extremely easy to understand. When I research something or read reviews, I never want to get confused. I want to get to the bottom of it at all costs. You could say “Well no one wants to be confused!” True, but how many times have you read an article about something only to be more lost than when you started. I’ve found over the years that techies love to speak in jargon, using foreign sounding language that makes zero sense to the average reader. I don’t want that here. My goal is to reveal the truth in an honest and straight forward way. I’ve found that it’s possible to understand complicated topics at a rudimentary level if you can frame things with everyday meaning, and organize your research into manageable chunks. This allows you to grasp advanced subject matter a lot better as well, if you know the basics and your notes are organized. There’s nothing wrong with layman’s terms! My Resource page is about helping you understand things in this way. 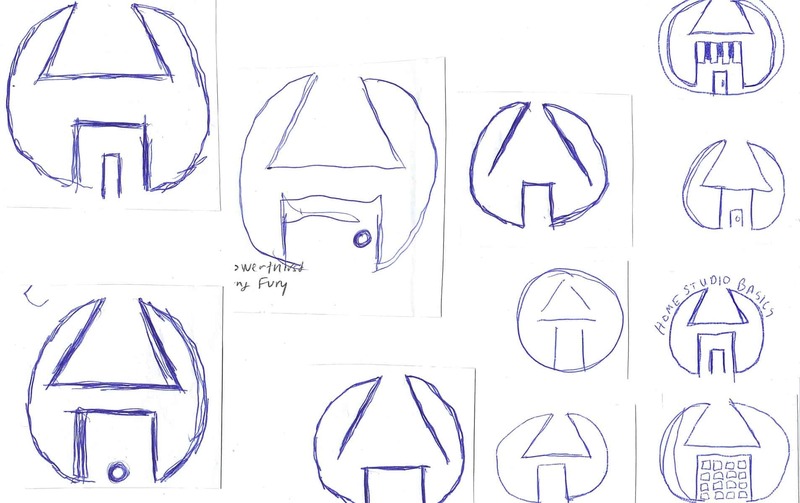 Use the basic shapes as symbols and identifiers. A circular ear-cup on a headphone. The possibilities here are vast. A studio monitor, one of the main pillars of any home studio. What are studio monitors? A mixer. What does an audio mixer do? Your audio interface, one of the main pillars of any home studio. Any sort of effects rack. A headphone Amp or DAC. How to choose a Headphone Amp! Tie in the “Home” part in a subtle and clever way. Click to see how it’s progressed!! Added text on top right. Was not used. Added a door and changed the slogan. This lasted quite awhile before the 2019 update. Blue alternate letters. Used very briefly. I experimented with hollow shapes here. Not used. with text and only the circle hollow. Not used. This is the one with the record button that I didn’t like. Not used. Colors and Text used for Anniversary logo. The 3 year anniversary logo! Updated the logo for 2019. See the changes below! With Text? Let me know what you think. Alternate Text. Still experimenting but I like just leaving it out altogether to be honest. Thickened up the lines. They needed to pop out more. For this I wanted to come up with something cool again. 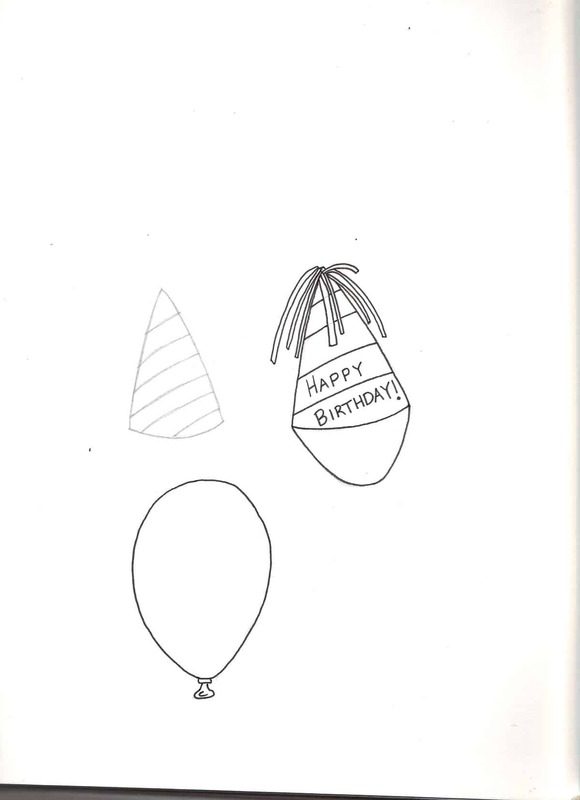 I decided to turn the circle into a balloon, and the triangle into a birthday hat. I think it turned out well! I also created a banner and drew up some confetti. The balloon and hat were hand drawn, scanned, and modified inside Adobe Illustrator. The colors of course had to be festive, so I went with a neon theme. Looks pretty exciting to me! Lol. A nice fella below made a comment saying how he enjoyed the hollow shapes better, as it better fits the theme of the site. He said this was because the hollow shapes remind him of blueprints, schematics, and other types of basic infrastructure. I think it also feels more futuristic and less dated. He commented that the old design seemed more 2005, while this one had the potential to feel more 2019 and beyond. I really had to agree with him after giving the hollow shapes a second look. I think this new design is more streamlined, tighter, and cleaner. It still retains the general concept of the roof and house (the home studio), but comes across as more classy and less kitsch. I also updated the tag line with a subtle but clever (in my opinion) play on words. If you’re making a sound decision, it’s sensible, logical, effective, reliable, thorough, healthy. It involves the use of good judgement. You get the idea. It fits perfectly with the theme of this site because so many people have thanked me over the last couple of years for helping them make great choices with regards to audio equipment. Lastly, I made the rounded rectangle a traditional squared off one to match the other shapes and brightened the color of the roof a bit. It started to get lost on the black background. 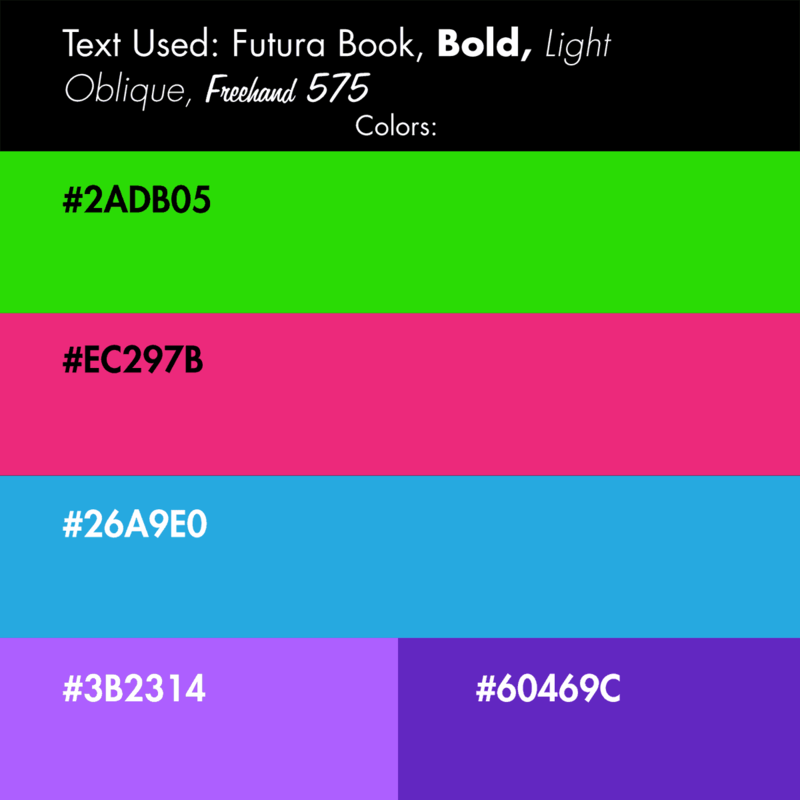 I also slightly modified the colors of the circle and rectangle so they would pop out a bit more. 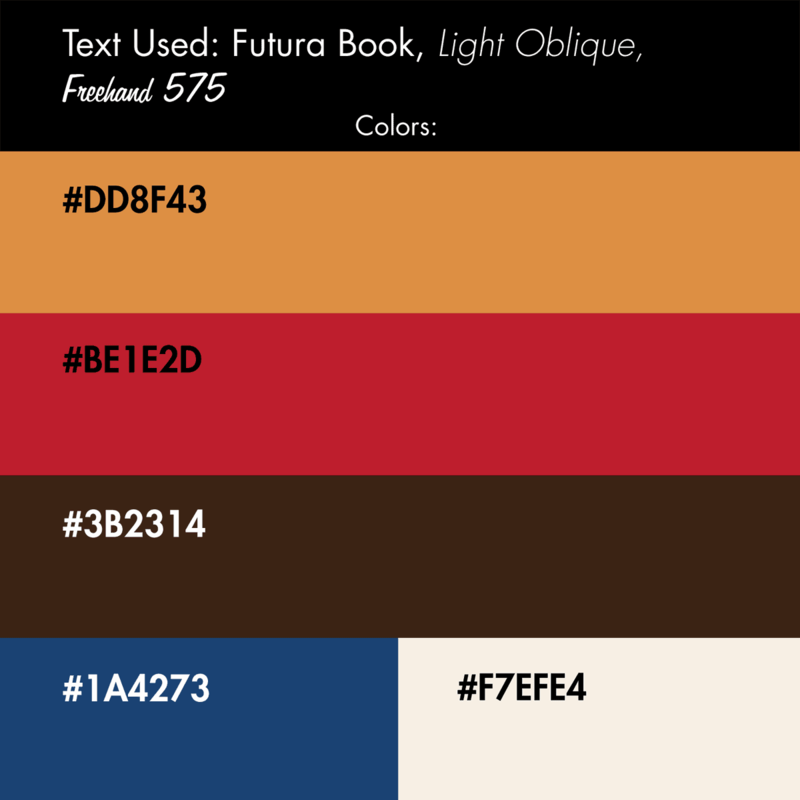 The other colors were a bit dull. Regarding the text “Est. 2014” I think it worked pretty well inside the circle on the old logo, but I prefer leaving it out here on the new one. I haven’t found a spot that really works and may not ever. I think it looks much cleaner without that. I hope you like it! Let me know what you think about adding in or doing away with the “Since 2014”. I Also would like to thank Andre for his valuable feedback in helping me to reconsider the look. I really hope you all enjoyed this, and gained some insight on my thought process and the journey that Home Studio Basics has taken to get to this point! If you have any questions or comments, please Contact me! I would love to hear your thoughts and opinions on the logo. Which one did you like best? Which ones didn’t you like? Are you enjoying the 2019 update? I very much look forward to speaking with you.. I totally understand you on the part about ‘not fitting in’ and growing up feeling somehow “different” (even though you totally blend in). It feels like some kind of ‘weird trick that life plays’ on us, growing up, lol. Glad to hear that you have found or (are finding) your way through this crazy living experience. I initially came through this site wanting to get recommendations on types of earphones, as I am also a ‘super creative’ (or whatever term there is to define us people) – basically, we love to be fully immersed in the creative experience from start to finish – which means that we are multi-talented, in various creative endeavours… so indeed, I totally understand you. It feels like the world just wants to classify everyone (or everything) – which is needed, I’m sure you understand that as well (being also very analytical in approach). Yeah, it’s true… However, I’m still learning to adapt to the phrase that, “It’s not what you DO, it’s who YOU ARE”… anyway, enough about that. So, I initailly came to get earphone reviews, and just information in general about home studio setups. But after reading through this section, I see more about ‘the person’ behind the site. So thanks for the transparency and the honest reviews… I almost totally forgot what my point was in writing this, so let me get back on track. As a designer myself, I try to keep up with the overall – I guess, ‘social consciousness’- if that makes any sense? Basically: (following industry blogs, reading articles, looking at top designers works, even young and local talent designers, etc) — so, after going through your variations, I definitely like the hollow ones. I just believe personally, that the hollow variations have more potential of ‘a 2019 feel’ – versus the current version – which feels more like, I dunno, a 2005 feel… (It could be the colors and orientation of shapes, I think). I also feel that the hollow ones have a lot more defining characteristics in being portrayed as hollow. 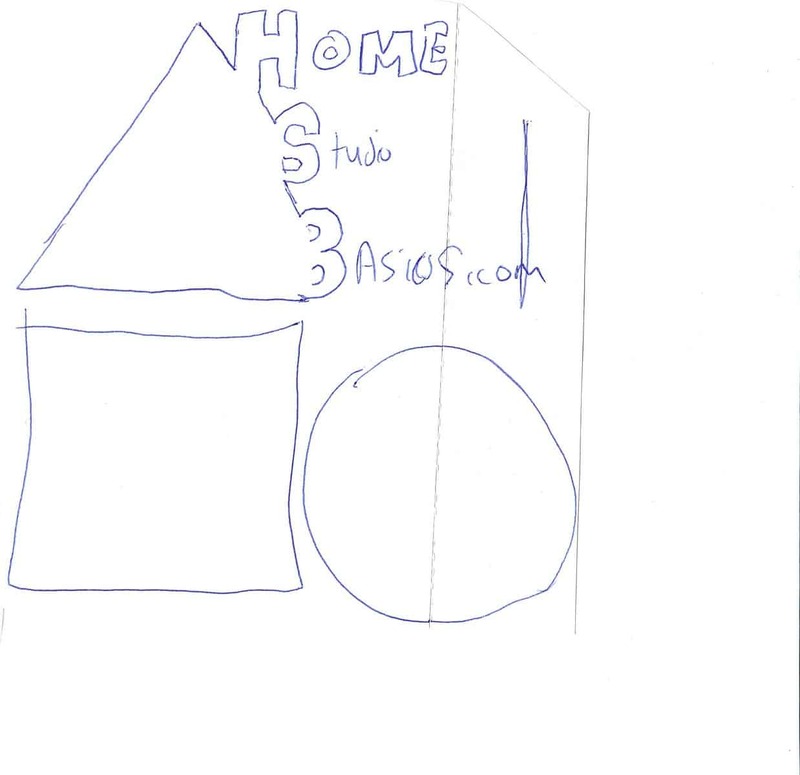 (Meaning, I think of schematics or blueprint designs, and types of “basic” infrastructures, when I look at the hollow ones — which might fit more in tune with the purpose of ‘home basics’ for your branding appeal)… Although I do see the look you are going for… I just feel that with a few variations in the orientation or placements of the shapes, maybe there’s a way to ‘unify’ the core purpose or find balance within a singularity. From my studies, I’ve seen that the K.I.S.S principle stands the test of time (and this has that for sure) – but on an even deeper level, I have seen that a minimalism approach really comes down to find that singularity, or ‘core essence’ in logo design. A great example of what I am describing is this blog article right here: (https://twistedsifter.com/2011/08/20-clever-logos-with-hidden-symbolism) — That spartan logo is straight #WINNING man! Anyway, I am not one who responds to many (or any) blogs, but I thought I would take some time out of my day to write this… thanks again for sharing your story… I’m sure there are a lot of people who can relate to this – (if they happen to find this link in the sespool of our internet information age) lol. Thanks so much for the nice comment! I definitely agree with you now that I look at the hollow shapes again. It does look more futuristic while the filled in ones look a bit dated. What did you have in mind about the orientation of the shapes? Your comment has prompted me to switch it up though. I think I’m going to change the tag line to “Helping you make sound decisions” since that seems to fit in line with the theme of this site more so than anything else (plus the cool little play on words, heh). People are always thanking me for helping them and that’s something I take great pride in (in a modest way of course). As for the other stuff, I also agree. I’m finding out that it’s important to stick to your guns no matter the situation in life. For instance right now I’m having a hard time financially but people are still coming here and leaving me positive feedback, thanking me for the work, and writing testimonials, etc. I’m still keeping in line with who I am regardless of what is or isn’t happening with regard to exposure, more views, more traffic, etc. Why is that? Well it’s because I’m an artist and I’ve told people I mostly do this because I want to. I enjoy the process more of making things nowadays, although I still struggle with “wanting to get it done” and admiring it later. I went on a date with this girl once and she was flabbergasted that I didn’t actually enjoy the process (we were discussing my paintings). This was years back, maybe around 2014. she was an artist too and we almost got into an argument about it because she said that was the whole point of making art. And at that time I disagreed and still do to a small extent. Like I said it’s hard for me still to this day to be fully immersed in art itself which is kind of a detriment that I need to work on. I’m always looking ahead to what’s next without being fully invested in the “now project” if you will. I suppose part of this stems from the anxiety/phobia I had in my younger years (around 2006), which was a dark time in my life on a mental and emotional level. I guess the other part is simply the pressures of life itself, and how things must get done at certain deadlines, stuff has to be paid off, etc. I’m trying to find the balance of pumping out quality work but not necessarily being such a strict perfectionist (because I really am). While I’ve recovered from the anxiety part in my day to day life, I think there’s still some residue left behind that effects me in my day to day work. I tend to multi-task WAY too much. Like if someone filmed me working around my apartment I go from A to B to C to D and beyond in this like circle of ADD until the tasks are done. Somehow everything gets done, and my apartment stays spotless without being OCD about it. Things are organized but they aren’t like overly neat if that makes sense. Anyways, this is getting way long winded. Would love to discuss this more. Again let me know about the orientation of the shapes and thanks again for stopping by! Hey, Stuart. That’s awesome man! 1)Funny story, I’m actually responding, bcuz I left a few tabs open — (as I’m still researching music equipments, and setup ideas) — and your “home studio” page tab was still open lol… Then I realized that the page logo was different, so I was like “wow, they heard my advice”… so I came back here to respond. 2) Regarding your story – No worries. (I am also STILL learning to NOT be long-winded — but alas, it’s a struggle. Because I usually DO HAVE some very relevant points, but after saying them all, sometimes I feel like I said too much — (or that simply, not everyone cared to hear them). Hmm. 1) Have you read a book called “Rocket Fuel”? (I actually haven’t yet, but I know it’s a good book)! The premise is that there are 2 people types of “integrators” and “visionaries”… basically, visionaries are big-thinkers, that are not really interested in “the process”, and integrators are vice versa — they love figuring things out — like the nuts & bolts, u know. As for me, I already knew I was a strong “visionary” type of thinker, but I think that the test helped reveal to me, the reason why I’m also very analytical. I have a good measure of “integrator” skills, but I believe it’s more so for (administration purposes) and not necessarily for (wanting to know all the iddy-bitty details, because it does get frustrating to me, lol). I hate constant, and redundant repetition (really not a 9-5 guy, at all). (I think the current logo is definitely a nice change. I think it’s a good choice to leave out the “Est. 2014”. It felt ‘out of place’ inside the original shapes. (I didn’t even realize the rectangle wasn’t hard-edged before this), lol. I also realized the triangle shape is only there as a symbolic roof, but aside from that, it’s not absolutely necessary (for the sake of minimalism) – but I didn’t want to overdo myself. I always think of logo design from a ‘corporate’ perspective… there were many ways to decipher this — but I just did what I could man. So, I hope you like my ideas). Let me know if you spotted any of the abstract/hidden symbolism I tried out… One cool thing I did, was, if you zoom into the exclamation point on the tag-line, that’s where I put the “Est. 2014) — it’s a subliminal branding tactic, lol.